Are you looking for activities that will save you time and money but that are big on fun and learning? All materials for the activities can be found at home or purchased in dollar stores. 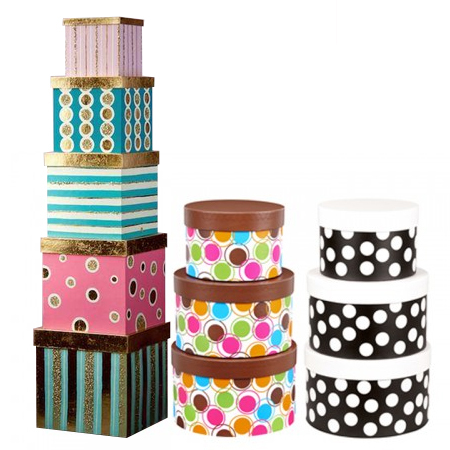 Find nesting sets of rectangular, square or circular gift boxes in various patterns and colours. Encourage children to explore; opening and closing, nesting and stacking possibilities and discuss colours and patterns. various coloured shapes cut from vinyl placemats to fit inside each box. Have the children sort shapes by colour, size and arrange from biggest to smallest. bells, beans and other small objects. Place in the boxes and have the children shake and guess what’s inside by the sound it makes. This entry was posted in Programming Ideas on November 13, 2018 by cissnewsletter.